There are a large number of estates along this stretch of Tay, some of them ancient, such as Ballechin, Pitnacree, Pitcastle, Derculich, which has its own quite large loch, high amongst the braes to the north, and Edradynate. Opposite on the south bank are the villages of Balnagard, Grandtully and Little Ballinluig, not to be confused with the better-known Ballinluig Station on the main A.9 highway 5 miles to the east, all attractively situated. At Ballinluig is situated the house that was the famous Daniel Stewart's first Free School. Grandtully is especially interesting, with both a splendid castle and a unique ancient church. Grandtully Castle lies, quite easily seen from the road, to the west, in a fine wooded estate, a tall and shapely tower-house of the later s 6th century, but with a much older nucleus and later additions. 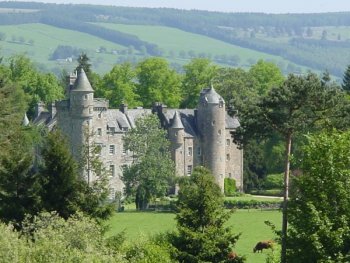 It is a seat of the Steuart-Fothringham family, the Stewarts having been here since the late 4th century, descending from Alexander 4th High Steward of Scotland. In 1626 Sir William Stewart, Sheriff of Perth, made various alterations, especially to the picturesque turreted roof-line. Occupying a strategic position, Grandtully was much in demand as a headquarters for commanders, Montrose, General Mackay, Argyll, Mar (of the '15) and Prince Charles Edward all using it. An officer of Mackay's is said to have been shot dead in one of the angle-turrets, the blood allegedly permanently staining the floor. More recently, the famous Admiral Earl Beatty was tenant here; and another shooting-tenant, the Maharajah Duleep Singh, distinguished himself one August Twelfth by personally shooting no fewer than 220 brace of grouse in one day. The former ancient church of St. Mary is less well known than it deserves to be. Set rather remotely on higher ground half a mile south-west of the castle, it has a wonderfully scenic position with glorious views. No longer used as a place of worship, it is now in the care of the Ministry of Works. Like Weem and others, it is divided into two separate portions. 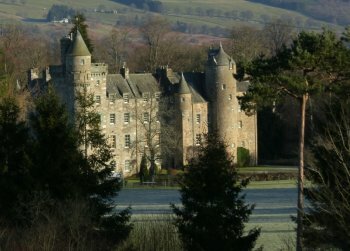 It was endowed by Sir Alexander Stewart of Grandtully in 1533, and restored in 1636. Its main southern section is most unusual in having a barrel-vaulted roof, lined with timber, which is brilliantly painted in tempera, with renaissance decoration, heraldic panels and portraits of the evangelists and other Biblical subjects. It commemorates Sir William Stewart who died 1646, and his wife Dame Agnes Moncreiff. Included in the heraldry are the arms of 'the Duik of Lennox and the Earle of Athiol', both Stewarts. This part is now very ill-lit with one small window, though artificial light is provided; but other windows in the west wall have been built up. The door into the northern portion has had a lintel inscribed s.w.s. D.A.M. 1636. A stone circle and a standing-stone are to be found down near the main road.